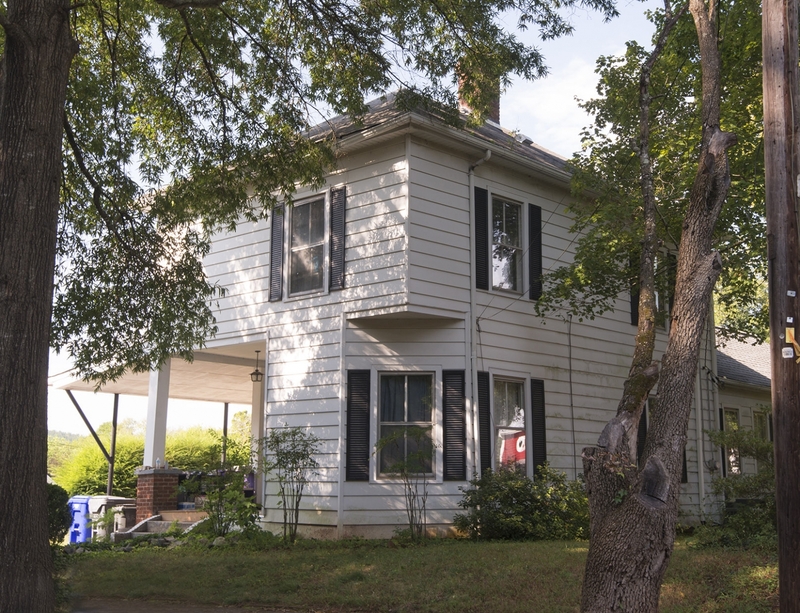 This two-story, hip-roofed house has been significantly altered with a replacement porch, additions at the left rear (southwest), aluminum siding, and its conversion to a multi-unit apartment building. The house is two bays wide and triple-pile with a canted bay on the first-floor level of the façade and a series of one-story additions along the left (south) and rear (west) elevations. It retains two-over-two, wood-sash windows and an interior corbelled brick chimney on the main block with six-over-six windows on the additions. An inset porch at the front left (northwest) is supported by decorative metal posts on brick piers and shelters a six-light-over- two-panel door. An adjacent, shed-roofed carport is supported by full-height metal posts. An entrance on the second-floor level of the left elevation opens to the roof of the shed-roofed carport and is sheltered by a small projecting gabled roof on knee brackets. County tax records date the building to 1900. The house historically matched the house at 208 North Churton Street.